The Sacellum Arden-Sul is the central church in New Sheoth. It contains an altar of Arden-Sul and the prophets Arctus (from Dementia) and Dervenin (from Mania). You can enter the Sacellum Arden-Sul from either Bliss or Crucible. 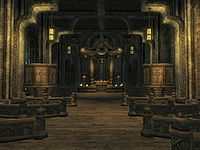 When you first enter the Shivering Isles, the great torch at the main altar is unlit. During the quest The Cold Flame of Agnon you are asked to relight the flame, in the process choosing whether to light it on behalf of Mania or Dementia. Your choice determines which priest leads the services and how the area is decorated. The Mania decoration is a vibrant one, complete with butterflies, and Mania flora. The Dementia decoration is a depressive one, with suspended corpses, and mounted skulls. After you have completed the Main Quest, you are able to transfer the flame from one side to the other (see notes). "Deceit. Hate. Subterfuge. Malice. Vengeance. These are words that the Maniacs would have you believe are "sins." Blasphemy! These words are the pillars upon which the teachings of Arden-Sul stand! Now is the time when we must band together and vanquish those who would pervert our forefather's tenets! Trust in Arden-Sul's legitimate teachings. Don't allow the decadent ways of Mania to blind your vision. Their answer to life's trials is viewed through the greenish haze of Greenmote and blurred by the taste of spirits. Lift yourself above these follies and meet your foes head-on. Twist a blade in their stomach instead of filling their ears with useless words. Our time has come, brethren. The die has been cast, and the Flame of the Demented blazes like the fire in our hearts! "My good friends, a most jubilant time is once again at hand. The Flame of the Maniacs burns bright, and we must celebrate! Now is a time for indulgence. Partake of the wine and the Greenmote! Cast off your clothing and your inhibitions! Sing and dance until the sun rises! Feast until your belly is full, then fill the wine goblets once more and toast our fortune. We shall raise our goblets to the great Sheogorath, may he rule the Isles for another thousand years. We shall raise our goblets to the Demented. Though misguided they are, we are all children of Arden-Sul's teachings and therefore equal. And finally, we shall raise our goblets to the great Arden-Sul: poet, thespian, author, lover, virtuoso, and artisan extraordinaire. To be a Maniac is to love and be loved. Spread the compassion and the warmth throughout New Sheoth and beyond. Smile at your fellow man. Help him when he falls. Remember, these are the times of mirth and cheer. These are the times of Mania!" Flame of Mania: Fortify Intelligence 10pts, Fortify Willpower 10pts, and Resist Paralysis 10%, all for 300 secs. Flame of Dementia: Fortify Luck 5pts, Fortify Speed 5pts, Fortify Sneak 4pts, and Fortify Security 4pts, all for 300 secs. After completing the Shivering Isles Main Quest, you gain the ability to transfer the Flame from one side to the other. Moving the flame will update the Sacellum's decoration and services. To move it, walk into the flame to take it, then walk to the other brazier. You can also choose to wear the flame indefinitely. Moving the flame will not allow you to receive the other raiment offered during the quest. An incomplete version of the Sacellum can be found in the Construction Set with different versions of the Altar for Mania and Dementia. In the version of the Sacellum found in-game, only the Mania version is present. This page was last modified on 28 December 2013, at 21:45.